The ex-Barcelona coach was hospitalised following a drastic downturn in his health which required emergency surgery, but was tragically unable to survive his battle with cancer. Former Barcelona coach Tito Vilanova has died at the age of 45 after losing his battle with cancer, the club have confirmed. The ex-central midfielder was admitted to hospital on Thursday following a downturn in his health which required an operation on his stomach on Thursday, with club president Josep Maria Bartomeu confirming the trainer was “fighting” for his life. However, Vilanova, whose post-playing career has been tragically plagued by cancer, was unable to battle any longer and passed away on Friday afternoon. Vilanova’s public health problems began during his final season as Pep Guardiola’s assistant when he was diagnosed with cancer of the parotid gland. He took over from his long-time friend for the 2012-13 season but suffered a relapse just six months into his tenure as head coach. He underwent surgery in December 2012, with Jordi Roura taking his place on the bench while he recovered in New York, before returning in March 2013 to see out the rest of the reason and guide Barca to La Liga victory. However, his continued health problems saw his step down as coach of the Catalans last summer, with Gerardo Martino taking the reins in his place. 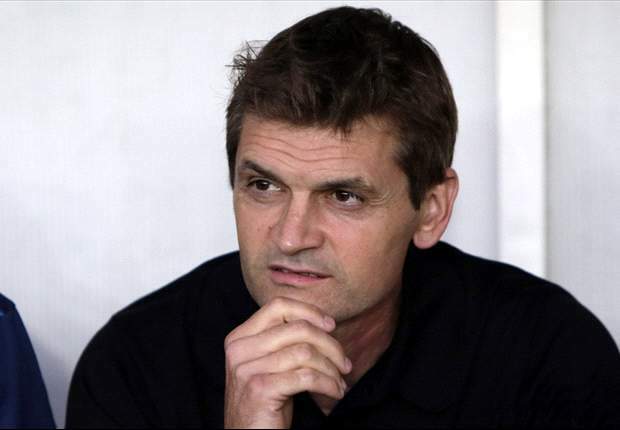 Vilanova has largely – and understandably – been out of the spotlight since he left his position at Camp Nou but rumours of his ill health have sadly been revealed to be true. He is survived by a wife and two children. The Catalans, whom he worked under for years before being promoted from within to head coach in 2012, also sent their condolences to the family of Vilanova. “The club wishes to express its most heartfelt sympathy to his family, who are being joined in these moments of mourning by Barcelona members and fans all around the world, as well as the rest of the footballing and sporting world. This entry was posted in E-NEWS, FOOTBALL, SPORTS and tagged BARCA COACH, CANCER, TITO VILANOVA.